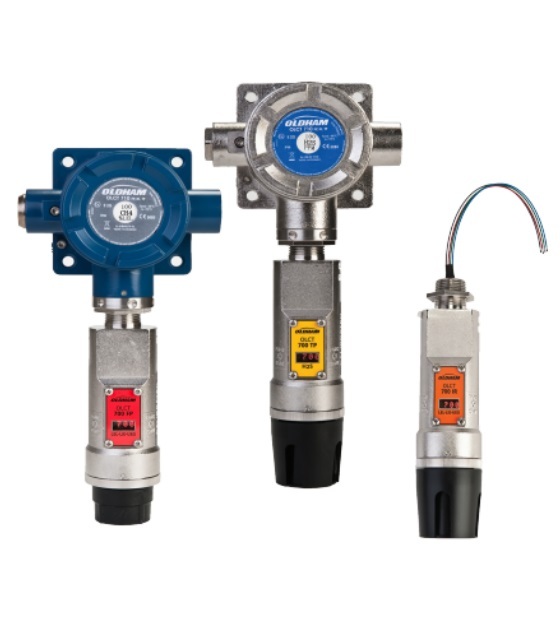 The Oldham OLCT 700 & OLCT 710 industrial gas detection sensors are a new generation of intelligent sensor modules that incorporate and integrate several leading edge improvements. The sensors are specifically designed for harsh and extreme locations. This new and superior level of environmental durability in sensor design includes an electropolished 316 stainless steel housing, multilayered transient spike protection circuitry and 100% encapsulated electronics. The sensor electronics are completely protected and immune to water ingress and corrosion. The gas detector sensor elements are all plug-in components and can easily be replaced in the field. Operator interface is non-intrusive via a small handheld magnet. Configuration and routine calibration is intuitive and menu driven with fully scripted instructions. Sensor status is displayed on a built-in alphanumeric LED display. Model Series OLCT 700/710 intelligent sensor modules feature dual outputs, a linear 4-20 milliamp analog signal and a Modbus RS-485 serial output. It is becoming increasingly important that safety systems meet the Safety Integrity Level (SIL) requirements of IEC 61508 and IEC 61511. The SIL rating can only be determined by considering the complete safety system.